I am interested in seemingly small, feminine revolutionary acts that lead to massive-scale positive change. My series references the four seasons, and occurrences of energetic exchange between individuals and the forests that surrounds them. 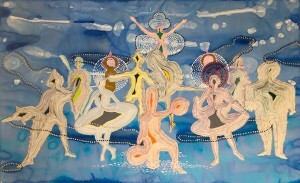 Harmonic Convergence depicts women dancing around a cell tower. Much like a maypole, the tower represents the beginning of a powerful new era—the birth of the age of communication in which we now live. While making this exhibition I became aware of the artist, Hilma af Klint, who was one of the earliest artists to work with abstraction. She was a member of a female group of artists called ‘The Five’, who were interested in complex spiritual ideas and practiced séances to be in touch with higher spirits. My painting of The Five depicts these women working on their abstract paintings in a Swedish forest. We Can’t Wait ‘Til Tomorrow references the 70’s rock band, The Runaways and takes it’s title from their lyrics. This era introduced the mainstream to the concept of an all-female rock band. My painting shows these women playing music in a forest—without an audience—playing purely for themselves.